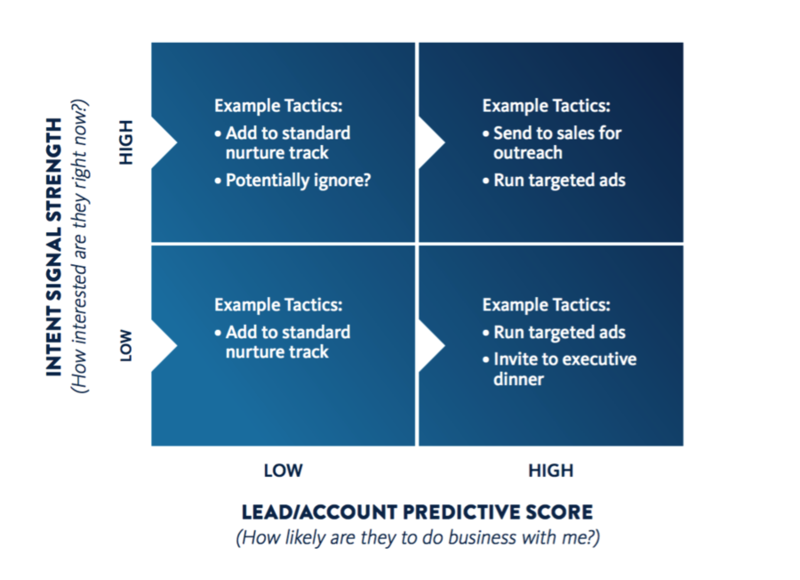 Intent Data for Account-Based Marketing: Diamond in the Rough or Just Plain Pixie Dust? Intent data has recently attracted the B2B marketing spotlight for the simple reason that technology makes more of it available than ever before. Intent data provides an indicator of a company’s willingness to engage with you. The stronger the signal, the more likely they are to respond to your outreach. Why is that? Because intent data shows which companies are actively interested in a particular topic or solving a particular problem. It is a time-based signal that, when used with predictive scores for your leads and accounts, will let you figure out when the best time is to reach out to the account. Intent data has become such a hot topic that we dedicated an entire eBook to the topic, and worked with analyst David Raab to help provide some clarity around what you can and can’t do with intent data. Because as important as intent data has become in predictive modeling, intent data is not a cure-all: it finds just a portion of active buyers, and must be used with other information to gain a full picture of the buyers it finds. On the other hand, intent data can be used in many ways beyond identifying prospects. So its value to marketers is in fact substantial. Prospects and customers are leaving a data trail everywhere – whether it’s on public forums on the Internet or your own internal databases – and intent data is a key part of this trail that marketers can access and utilize. Marketers that tap this wealth of data and share it with sales for target account identification, prioritization, executing personalized campaigns and contextualizing sales conversations, are going to win. Marketers need to understand all these nuances to make the best possible use of intent data. Our eBook describes where intent data comes from, the best ways to transform raw data into a signal marketing teams can use, how it can be applied, and where it fits into marketing and sales processes. Any marketer struggling to make sense of the noise surrounding intent data will find this eBook an excellent place to start. So please download the eBook here, and let us know what you think!